Of all the metrics that matter, one of the most impressive to me is that my boss – Jeff Ratcliffe – is the only fantasy analyst to rank top-15 in the FantasyPros ranking contest in each of the past seven seasons. Ratcliffe is also in charge of our fantasy projections (which are available to Edge and Elite subscribers). In an attempt to borrow from Ratcliffe’s hard work and intellect, I’ll always spend a few hours looking at our projections each time I decide to tinker with my rankings. Oftentimes, I’ll find a player much higher or lower in our projections than in my rankings and it will force me to reevaluate my position. I was looking at our projections yesterday and noticed something particularly interesting. Of our 12-highest-projected flex-eligible players in PPR leagues, 11 were running backs. This syncs fairly close to ADP, where 10 of the top-13 players are running backs. However, this is a big change from 2015 and 2016 when only six running backs made up the top-12 players by ADP. What’s going on here? Just two years ago, Shawn Siegele’s “Zero RB” strategy was all the rage and running backs were considered a devalued position. The prediction error involved when drafting running backs is higher than for other positions. Running backs carry more injury risk than all other positions. I’ll address Siegele’s second point first and his first point second. Perhaps Siegele is right and running backs are more injury-prone than the other positions, and thus carry more risk. Perhaps this is why running backs dominated the top tier of our projections – an exercise where we’re assuming every player stays healthy and plays in all 16 games. So, I looked back at all players drafted in the first 10 rounds (by ADP) over the past nine seasons and only looked at games lost due to injury (scrubbing out suspensions or games inactive due to performance). Indeed, Siegele’s narrative held true, but not dramatically so. Each running back missed, on average, 2.8 games per season, but this was only 0.3 more than tight ends and 0.7 more than wide receivers. Although running backs might hold more injury-related risk than the other positions, this is offset by a greater upside when on the field. Over the past 15 seasons, the 10 highest (flex-eligible) seasons in fantasy points per game were from running backs, as were 14 of the top 15 (93 percent), 24 of the top 30 (80 percent), and 35 of the top 50 (70 percent). Two seasons ago, Le’Veon Bell outscored the closest wide receiver (Antonio Brown) by 5.6 fantasy points per game. Last season, Todd Gurley outscored the closest wide receiver (Brown) by 3.7 fantasy points per game. During the fantasy postseason (Weeks 14-16), last year, Gurley outscored the closest non-running back by a whopping 52.7 total fantasy points. While running backs carry more injury risk (but only barely so), top-tier running backs have a much higher ceiling and are typically the players that can carry you to a championship victory. The Zero RB strategy gained in popularity following the 2015 season, and that’s no surprise to anyone who has looked at the data and is in any way familiar with the notion of hindsight bias. By contrasting WR1 (top-12) total fantasy points scored in each year with RB1 total fantasy points, the 2015 season pops out as a massive outlier. In the 10 other most recent seasons, WR1s outscored RB1s by 74.2 fantasy points per season on average. In 2015, WR1s outscored RB1s by 901 total fantasy points, or 12.1 times the typical average. Obvious why #ZeroRB was all the rage after 2015. Still, as implied by Siegele’s unanswered first point, it’s possible we’re just not very good at drafting fantasy running backs (outside of simply the higher injury rates), perhaps due to some other unforeseen event like being overly optimistic on a player’s role or job security. Running backs can have a higher ceiling, but maybe we’re bad at projecting which running backs that might be. However, the data suggest that is false. Looking back at ADP data since 2009, the first running back selected outscored the first wide receiver drafted, the second running back selected outscored the second wide receiver drafted, and so on up until the 22nd player selected at each position. 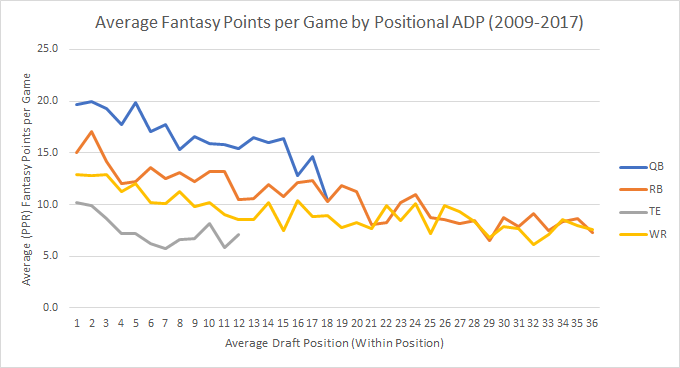 So, it appears, running backs are actually a safer investment than wide receivers early on, and ADP is pretty good at predicting fantasy success at the position. So, where should we be drafting these running backs, and which running backs should we be drafting (or avoiding)? My strategy is the same it’s always been, which also means it’s different every year. I draft players, not positions, and stay fairly close to my rankings. ADP isn’t stagnant, which means value isn’t stagnant. When I’m asked which players I like most in a given year, I’ll say it depends on your league and the ADP of that year (particularly the league host site you’re using to draft). Jerick McKinnon is a value in the third round, but he isn’t a value in the first. Where will I be drafting running backs this year? Well, that depends entirely on if I think there are a number of mispriced running backs in the later rounds. This year that is not the case, and thus, in most drafts I’ve participated in this season, I’ll take two or three running backs in the first four rounds and then ignore the position for almost the rest of the draft. As I alluded to earlier, running backs offer the highest ceiling at any flex-eligible position, but that’s not true for all running backs. Typically (in PPR leagues), it’s only true for “bell cow” running backs – running backs who rank highly in snaps, carries, and targets, and in percentage of their team’s running back snaps, carries, and targets. These running backs are scarce, which makes them more valuable, but also means the opportunity to draft one dries up rather quickly. I’ll have a longer article at some point that highlights just exactly who I think these running backs are and which lower-priced running backs might have that potential. Mostly, I’m completely fading all of the early-down specialists who don’t rank highly in targets, pass-catching specialists who don’t rank highly in carries, and all running backs stuck in a committee. It’s possible a few of these running backs will rank highly in fantasy points, but typically, their upside is lower and they are more dependent on gamescript. That latter point is especially important. In 2015, Danny Woodhead and Doug Martin finished top-five among running backs in total fantasy points, but both running backs were maddening to own and were rarely started in their best games. Woodhead finished outside of the top-24 running backs in 44 percent of his games and Martin finished outside of the top-24 in 38 percent of his games. After the small pool of bell-cow running backs has run dry, I’ll start loading up on wide receivers, and that occurs more quickly based on the number of wide receivers or flex players you can start each week. Unless you got really lucky with the running backs you drafted, you’ll typically want to start a wide receiver in the flex in PPR leagues. Scoring also has a massive impact on my strategy – running backs are more valuable in standard rather than PPR leagues. While I’m not a true Zero RB advocate, I’ve been forced to employ that strategy in some drafts and have been happy with the results. It’s a nice tool to have in your arsenal if your league-mates keep giving you value at the other positions. In most drafts this year, however, I’m hoping to land two or three running backs in the first four rounds, but I’m also rarely ever reaching on a particular player.